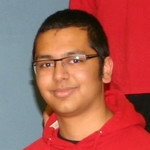 Kripa is 18, and studying at Cambridge University. He was previously at Haberdashers’ Aske’s Boys’ School, and was part of their winning team in the Schools' Cup for three consecutive years. He made his international debut in the 2015 Channel Trophy, playing in the U21 team with Jonathan Clark. they also played together in the 2016 event. Playing with Jonathan, Kripa also reached the final of the Under 21s competition at the 2016 European Youth Pairs Championships - finishing in 11th. Since writing this biography Kripa has been a key member of the U21 team which, in 2017, earned a bronze medal at the European Championships, won the Peggy Bayer Trophy, and finished second in the Channel Trophy competition. These performances earned him the Young Player of the Year Award for 2017.